It’s April 1 and we all know who’s celebrating his birthday today! 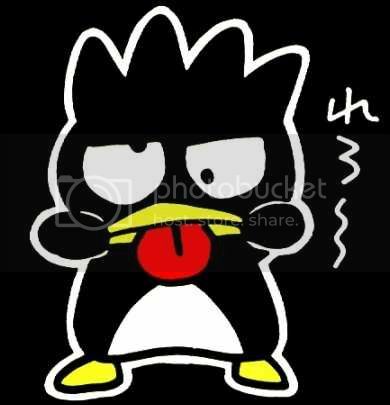 Why, it’s none other than our mischievous but lovable penguin BADTZ-MARU! For those who are new here in SanrioTown, here’s a little info about Badtz. Badtz-Maru is a very mischievous penguin hailing from Gorgeoustown, where he lives with his mother and pinball-playing father. He was born in Oahu, Hawaii. A bit vain, he spends a lot of time styling his hair. He loves traveling. He’s also a bit selfish. He loves making fun of things he finds silly. His hobby is collectingposters of bad guys in movies. He is a first grader in Gorgeous Academy. Santa’s Drops Get a Gift Event! Ho ho ho! Merry Christmas everyone! Now there’s more reason to play Santa’s Drops in SanrioTown’s Game Center. Play the game and catch one of Santa’s rare drops to get an opportunity to win cool Christmas gifts from us! 2. Make sure you catch it! Uncaught rare drops from Santa wouldn’t be counted as “caught” even if a player is lucky to see one. 3. Players who catch a rare drop item and who submit their score will get the chance to win a Christmas gift from us at the end of the event via lucky draw. More than 20 players can win any of these prizes so start playing now! 1. Only SanrioTown members (@hellokitty.com, @mymelody.com, @kuririnmail.com) are eligible to participate in the Lucky Draw. Members whose accounts are @hellokitty.com.sg, @hellokitty.com.my, etc. are not eligible. 2. Winners will be picked via lucky draw. 3. SanrioTown reserves the right to change the conditions of this competition at its own discretion. 4. Sanriotown reserves the right to extend or terminate the competition at its own discretion. 5. Members can submit as many entries as desired and all entries will be considered by SanrioTown as long as it meets all the guidelines. 6. All selections are final. Curious about the SanrioTown Game Center? Take a peek at it by clicking here. July Downloads are Now Available! It’s that time of the month again! The June freebies are now available for your downloading pleasure. This includes wallpapers, calendars, icons, and screensavers featuring your favorite characters, so make sure you grab these now! To download them, simply log in to your SanrioTown account and then go to the "Enjoy Downloads" section. Don’t have a SanrioTown account? Don’t worry! Click here to register and get your free account now!